The Leopard by Ruskin Bond is a short story that highlights the relationship between humans and animals. The story is set against the forest of Mussoorie – especially of the time when the forest belt was declining and hunters were growing. A little far from his cottage, down the hill, Ruskin goes for a walk around a stream. After some time, the trail of the path disappears in the forest and a stream appears, its water making a soft gurgling sound flowing down the ravine. The ravine is so deep that below only shadow appears, nothing else. He is a frequent walker through that path. Birds, monkeys, and other herbivorous animals are familiar with his smell. They know he is not a hunter. At times, he spots a silent leopard at the stream for drinking water. Ruskin often stops upon seeing it. That also happened that they both crossed each other’s path several times. Even animals can smell the intentions of man. Like other animals, leopard sensed Ruskin as a harmless human. It trusted him. On day Ruskin finds a few men resting under a tree with guns. They are shikaris, they asked Ruskin if he had seen any leopard here. Ruskin denies. The thought and sight of hunters made him feel bad for that leopard. Several days pass by and Ruskin does not see that leopard. One day Ruskin goes to a serene and silent hill. The silence there begins gnawing him. He sensed something is eerie. 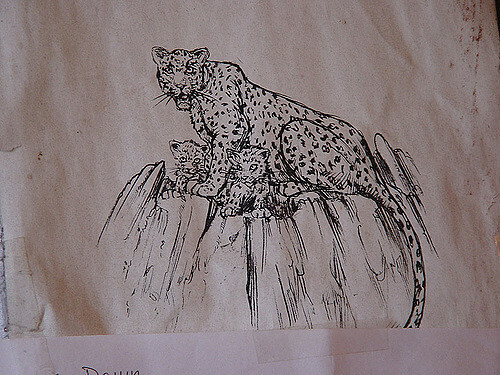 When he focuses to one cave, it is dark inside, and he feels that there is that leopard. He returns home silently. Next day while on a walk, he sees some men making a jubilant sound. When he sees them, he freezes with disbelief. On a bamboo pole the same leopard’s corpse is hanging. The men were singing their song. “We told you that there is a leopard in the jungle”, said one of the shikaris. He, then, remembers the lines of a poem by D.H. Lawrence: ‘There was a room in the world for a mountain lion and me’. This line is heart-touching and reminds us the distance growing between humans and animals. Once when civilization was not so taking up, humans and animals both lived side by side, in forests and around by.